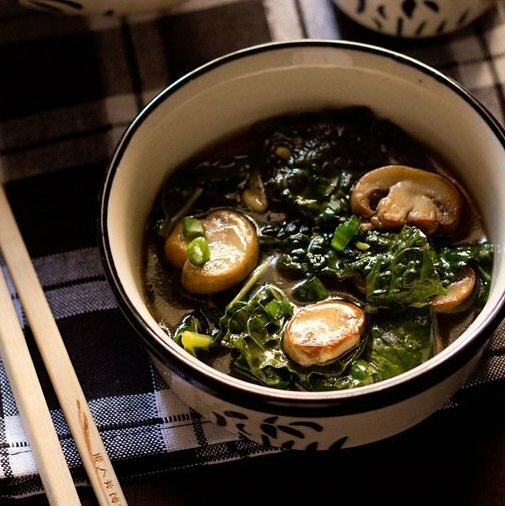 kale and mushrooms in ginger sauce - kale leaves and button mushrooms in a lightly spiced ginger sauce. 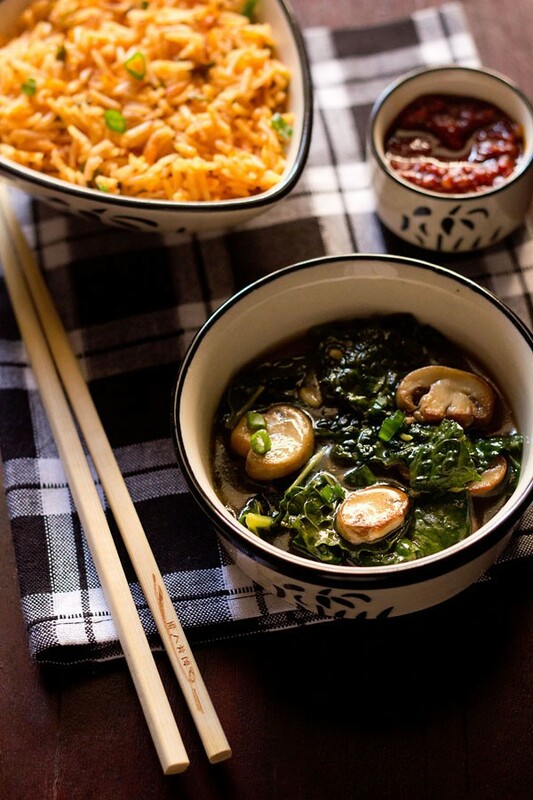 kale leaves recipe – kale leaves and button mushrooms in a lightly spiced ginger sauce. 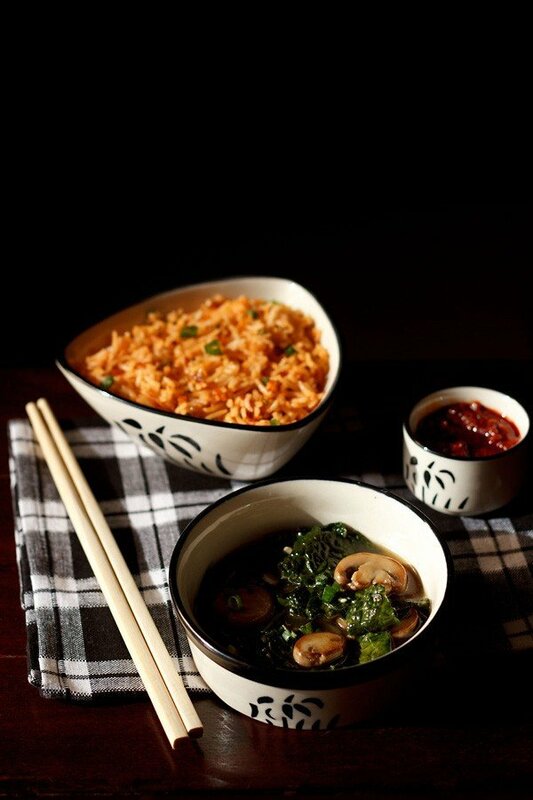 i had made this kale & mushrooms in ginger sauce as a accompanying side dish with schezwan fried rice. i sometimes make mushroom in ginger sauce or garlic sauce, when i make veg fried rice or schezwan fried rice. basically the recipe is just mushrooms in ginger sauce, where i have added kale leaves. so before you ask me where did i manage to buy kale in india, i will give you the link. kale is not easily available in india. i buy a few vegetables from a website and it was here, that i found the kale leaves. i brought it many times thereafter. usually i add them to dal and make a kale dal. 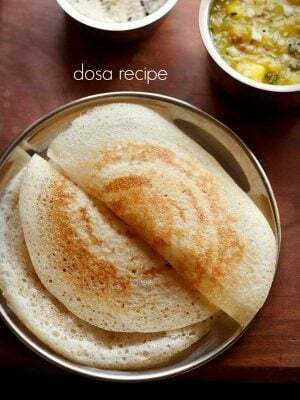 similar to the way we make spinach dal. i have also made kale pakoras. i purchase kale from the greentokri website. i don’t know what is kale called in hindi. basically kale is a relative of the cabbage family. however, unlike cabbage, there is no head formation in kale. it has dark green or purple curled leaves with bitter notes and a chewy texture. 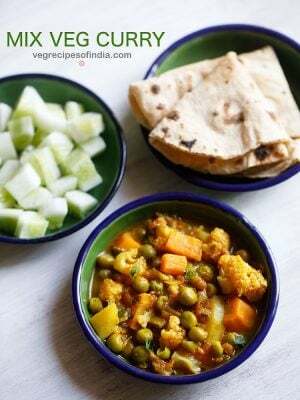 the bitterness is not like the bitterness of bitter gourd or karela. its mildly bitter and eatable. for an indian taste which is used to having bitter stuff like karela or neem, kale is easily eatable. the taste is also some what like the taste of drumstick leaves. so in this dish, you will get to taste the faint bitterness of the leaves. if you like kale, then this recipe is good. the sauteed mushrooms add a contrasting texture in the dish. 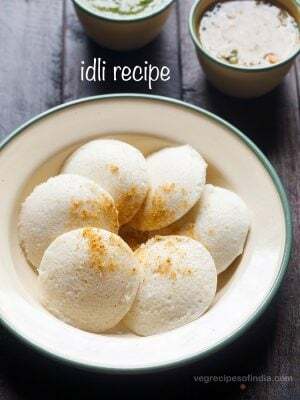 the recipe is mildly spiced and can accompany any fried rice dish like sweet corn fried rice or burnt garlic fried rice or even plain steamed rice very well. being a superfood, kale is very rich in essential nutrients. read more nutritional information about kale here. 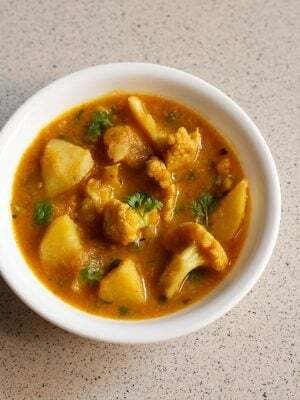 if you are looking more mushroom recipes then do check kadai mushroom, potato mushroom, mushroom curry and mushroom pasta. rinse and slice the mushrooms. rinse and chop the kale leaves. you can slice off the central stem if you prefer. i usually keep them. heat oil in pan. add the ginger, garlic and green chilies and saute for a few seconds. add the spring onions/scallions and saute for 1 or 2 minutes. add the mushrooms and stir fry the mushrooms on a high heat till the mushroom gets browned from the edges. add the chopped kale leaves. saute till the leaves become tender. about 7 to 8 minutes. then add 1/2 to 3/4 cup water and bring to a simmer. dissolve 1 tbsp arrow root flour or corn starch in 1/3 cup water. add this mixture in the pan. simmer till the sauce thickens and become smooth with a glaze. garnish with scallion greens and serve kale & mushrooms in ginger sauce hot with fried rice or steamed rice. 1. you could add kohlrabi (ganth gobi) greens. but the leaves should be tender and young. 2. collard greens can also be added. they are known as karam saag and also added to prepare haak, a kashmiri dish. 3. malabar spinach. also known as pui saag in bengali. 4. even chinese cabbage bok choy would be good. 5. you can try spinach too, but spinach won’t retain its shape and bite like kale. welcome anamika. i will post 2 more kale recipes soon. Thanks. I want to put in the food without letting my husband and kiddo know. thy both are fussy eater. Please suggest something like this. for this dish, the taste and texture of kale is distinctly felt. you cannot hide it from them 🙂 however, you can add baby spinach or regular spinach instead of kale and it would be still be a healthy recipe. the presence of spinach won’t be felt. robt, we have disabled that plugin which notify for new comments. while disabling the plugin we had removed all the emails which had subscribed for comments. so we don’t know why you are still getting it. you can spam the email 1-2 times and then it will not come in your main inbox. i hope it helps. Thank you, kale is avaiable quite easily where i live. 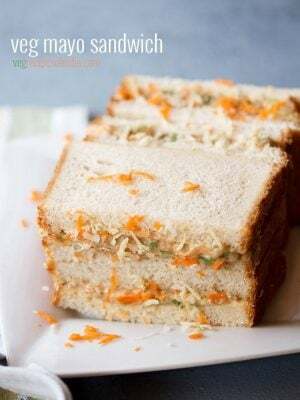 i will be making this for dinner in the next two days! Not sure if I missed it but When do you add ginger and soy sauce? thanks carita for pointing out the error. i have updated the recipe instructions. Kale may be difficult to buy in India, but if you have even a small spot where you can grow plants, it’s very easy to cultivate kale plants. This year, I have 2 kale plants in my tiny veggie garden and I’m eager to try this recipe using my own kale. thanks PhilH for this awesome information. but from where we can get the kale seeds or it grows from the stem. any info will be appreciated. thanks purvi. the closest greens i can think of which will be available in india, would be kohlrabi (ganth gobi) greens. but the leaves should be tender and young. collard greens can also be added. they are known as karam saag and also added to prepare haak, a kashmiri dish (more info here on wikipedia – http://en.wikipedia.org/wiki/Collard_greens). another one is malabar spinach. also known as pui saag in bengali. even chinese cabbage bok choy would be good. you can try spinach too, but spinach won’t retain its shape and bite like kale. Hi dassana thanks for replying .while writing to you I did think of pui saag since it seems kale has the same crispyness as pui but was not sure on taste as have never tasted kale.might make it this weekend with one of the substitute. kale tastes somewhat like drumstick leaves. 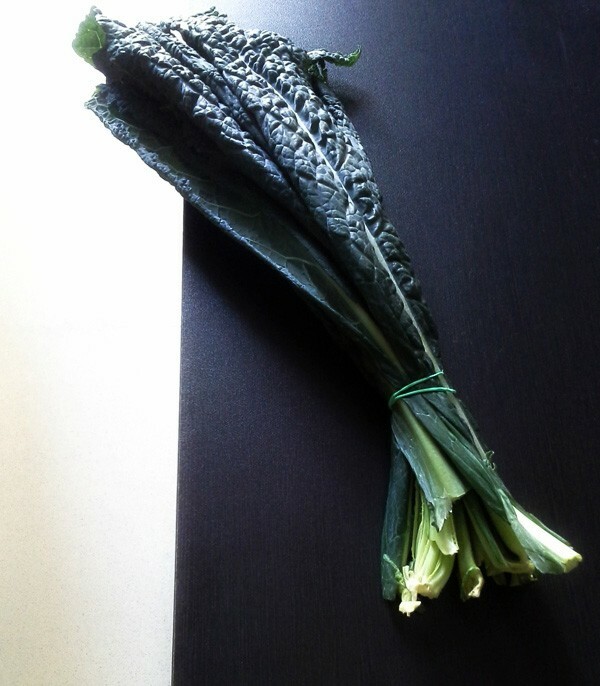 if you have had drumstick leaves before, you will feel familiarity with kale. both kale leaves as well as stems have a crunch and do not get soggy like palak or methi leaves. in the case of malabar spinach, i think the stems will have that smooth bite, but the leaves won’t have any crunch. 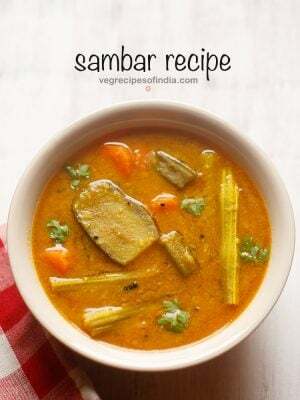 i usually make malabar spinach (pui saag) with indian spices, but i feel it will taste good in this recipe too. do try and let me know how the dish turned out. I think mustard greens might be a good substitute for kale. I find the taste and texture to be quite similar. alpana, you can try mustard greens. but they might add some pungency in the sauce.